Giffard Park Sanitary Station is a minor waterways place minor waterways place place on the waterways major waterways place village town city on the Grand Union Canal (Grand Junction Canal - Main Line - Gayton to Brentford) between Great Linford Railway Bridge No 76A (disused) (6¾ furlongs to the west) and Bridge No 78B (Grand Junction Canal) (2¾ furlongs to the south). 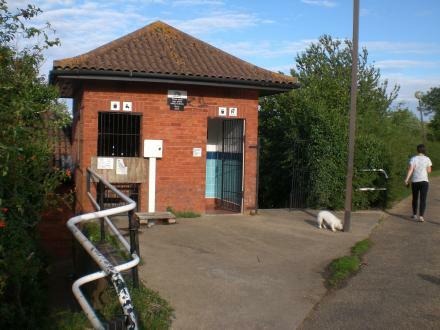 The nearest place in the direction of Great Linford Railway Bridge No 76A (disused) is Giffard Park Moorings (7 day moorings); ½ furlongs away. The nearest place in the direction of Bridge No 78B (Grand Junction Canal) is The Giffard Park PH; ¼ furlongs away. Milton Keynes — 1505 yards to the south. Milton Keynes — 1200 yards to the southeast. M1 Motorway Southbound, Junction 1415 Newport Pagnell, Welcome Break, Newport Pagnell, MK16 8DS — 1196 yards to the north. Milton Keynes — 126 yards to the southeast. Btw Jct 14 & 15, M1, Newport Pagnell, MK16 8DS — 1253 yards to the north. 18 elthorne way newport pagnell, Milton Keynes, MK160JR — 1487 yards to the northeast. Neath Hill, Milton Keynes, MK14 6HG — 1610 yards to the south. Great Linford, Milton Keynes, MK14 5DU — 1211 yards to the southwest. Milton Keynes — 157 yards to the north. Unit 48, Tanners Drive, Blakelands,, Milton Keynes, MK14 5BW — 593 yards to the northeast. Milton Keynes — 1460 yards to the north. Lower Stonehayes,Great Linford, Milton Keynes — 1080 yards to the south. Broadway Ave, Milton Keynes, MK14 5QN — 55 yards to the east. Newport Pagnell — 1224 yards to the north. Milton Keynes — 1222 yards to the south. 984 yards to the southeast. Milton Keynes — 585 yards to the northeast. 11 Hill View Wolverton Road, Newport Pagnell, MK168BE — 1207 yards to the northeast. Great Linford — 1406 yards to the southwest. Milton Keynes — 1335 yards to the north. Pipard, Milton Keynes, MK14 5DF — 1267 yards to the southwest. Bernay Gardens, Bolbeck Park, Milton Keynes, MK15 8QD — 1507 yards to the southeast. Wolverton Road, Great Linford, MK14 5AH — 1257 yards to the west. Newport Pagnell, MK16 8DE — 1159 yards to the north. Milton Keynes — 258 yards to the southeast. Great Linford MK14 5DZ, Milton Keynes, MK14 5DZ — 629 yards to the west. giffard park, Milton Keynes, 0000 — 157 yards to the north. 22 Tower Drive, Neath Hill, Milton Keynes, MK14 6HY — 1537 yards to the south. 5 Delaware Drive, Milton Keynes, MK15 8HG — 1382 yards to the southeast. Great Linford primary school, Milton Keynes, MK14 5BL — 1122 yards to the southwest. M1 Northbound, Milton Keynes, MK16 8DS — 1176 yards to the north. Monday - Village Hall, Biddenham Tuesday - Village Hall, Cranfield Wednesday - Middleton Centre, Newport Pagnell, Milton Keynes — 55 yards to the east. Milton Keynes — 1225 yards to the west. The Grove, Newport Pagnell, Milton Keynes, MK16 0BJ — 1190 yards to the northeast.